Apple Could Help Boost Right-to-Repair Efforts | HOBI International, Inc. If you’re an Apple owner who has ever been in need of an iPhone or MacBook repair, you’ve more than likely experienced waiting in line at your nearest Apple store’s Genius Bar so an authorized Apple technician can tell you what’s wrong and how much it will cost to fix it. If the device is out of warranty, it will probably be expensive to fix. And while other companies can repair an Apple product for you, you run the risk of invalidating your device’s warranty. Right-to-repair activists are looking to change this. 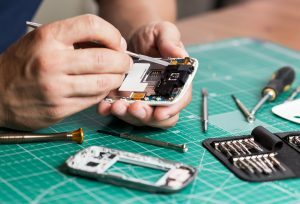 Companies like Consumer Reports (CR), the EFF and iFixit are among the names that are helping the right-to-repair movement grow and have been fighting for standards that would force manufacturers to make it legal and practical for consumers, or independent repair shops, to fix devices. In the past, Apple has restricted the types of repairs that independent companies and third party technicians can do, arguing that it was too difficult for non-Apple authorized techs to perform repairs, and that such repairs could endanger the security of Apple products. In fact, the company is known to join others in the tech industry to fight legislation that would make it easier for consumers to repair their Apple hardware. However, as the right-to-repair movement grows, the company may be relenting. Multiplatform and multimedia publication group, Motherboard reports that an internal Apple document shows the company could be shifting its stance on the right-to-repair movement. A presentation sent to some repair companies in April 2018 indicates that Apple has given them access to Apple diagnosis software, a wide variety of genuine Apple repair parts, and repair training. It also places no restrictions on the types of repairs that independent firms are permitted to do. “Manufacturers say it would undermine their security models, but if it’s possible for them to do what this document is saying and roll out their diagnostic software to thousands of unaffiliated companies, then lobbyists have been lying to legislators,” iFixit’s Kyle Wiens told Motherboard. Of course, it isn’t just Apple that has been holding tight to repairs. Other tech companies like LG, Samsung, Microsoft and John Deere have made it difficult for consumers to have their products fixed at places other than “authorized repair” shops. Whether Apple is bracing for future right-to-repair legislation or is using this as an attempt to negotiate the impending legislation on their own terms, if Motherboard’s reports prove to be accurate, this could be a big boost for consumer rights.